Note:This is an original G1 and is marked Takara Japan. It is not a knock off or reissue. All of the major websites and identification books break down the toys this way and so do I. Joints:Slighy left ankle/wing and is a little hard to make stand in robot mode. 1985 Snarl Complete. Toy is complete and in good shape. Vintage 1985 Hasbro G1 Transformers TRACKS. Condition is Great. Light wear to stickers. Only comes with what is shown in photos. Shipped with USPS First Class Package. 1985 Grungy Power Warrior. Complete MIB Boxed Original. "Your collectible toy source.Planet Force! Toy is complete and in good shape. PLANET FORCE. 1985 Soundwave & Buzzsaw. Soundwave's head does tend to lean back. Toy is complete and in good shape. PLANET FORCE. Selling a toy collection? Message me. Figure Condition: No spoiler and was glued in place at one point. Comes as shown. 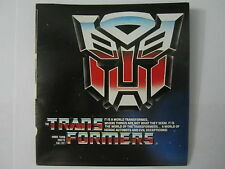 The Transformers: G1: "Have the Decepticons defeated us once and for all?" O. F.
Selling toy a collection? Message me. Figure Condition: Rated a 90 with light wear and the mechanism is working. It is not broken. My grading scale is 1 - 100 with mint flawless a 100, near mint a 95, excellent a 90 and so on. This item is an authentic original vintage Hasbro item. This item is not a fake, bootleg, reissue, remake or encore. Comes as shown. Sticker Condition: Some missing Accessories: 100% Complete Joint Condition: Tight, except one arm. Toy is complete and in good shape. Box has wear, creases, etc. (no booklet). PLANET FORCE. Jetfire is in minty white condition with excellent coloration. This includes sticker wear, slightly loose joints, minor paint wear, and slight discoloration. He transforms nicely and is 100% complete. Selling a toy collection? Message me. Figure Condition: Rated a 60 with playwear. It is not broken. My grading scale is 1 - 100 with mint flawless a 100, near mint a 95, excellent a 90 and so on. This item is an authentic original vintage Hasbro item. This item is not a fake, bootleg, reissue, remake or encore. Comes as shown. Stickers: Some have some wear Accessories: None Joints: Loose. These are both in excellent condition. This is sold as-is, you will receive the exact item in the pictures. 1985 Ramjet Complete. Toy is complete and in good shape. Selling a toy collection? Message me. Figure Condition: Rated an 80 with some wear, but needs cleaning. It is not broken. My grading scale is 1 - 100 with mint flawless a 100, near mint a 95, excellent a 90 and so on. This item is an authentic original vintage Hasbro item. This item is not a fake, bootleg, reissue, remake or encore. Comes as shown. Sticker Condition: Some missing Accessories: 100% complete with all accessories, they are rated a 70 with some wear. Joint Condition: Tight. Selling a toy collection? Message me. Figure Condition: Rated a 90 with light wear. It is not broken. My grading scale is 1 - 100 with mint flawless a 100, near mint a 95, excellent a 90 and so on. This item is an authentic original vintage Hasbro item. This item is not a fake, bootleg, reissue, remake or encore. Comes as shown. Sticker Condition: Rated a 90 Accessories: 100% complete with all accessories, they are rated a 90 Joint Condition: Tight, except arms as typical due to the ball and socket joint design (if you want to correct put clear nail polish on). This is sold as-is, you will receive the exact item in the pictures. Missing the missiles and launcher. Note: This is an original G1 version and is stamped Takara Japan. It's not a reissue or KO. Good condition. Selling a toy collection? Message me. Figure Condition: Rated an 80 with light wear. Both of the head tabs are broken, but it holds fine. My grading scale is 1 - 100 with mint flawless a 100, near mint a 95, excellent a 90 and so on. This item is an authentic original vintage Hasbro item. This item is not a fake, bootleg, reissue, remake or encore. Comes as shown. Sticker Condition: Rated an 80 Accessories: 100% complete with all accessories, they are rated an 80. Joint Condition: Some loose as typical on this item. Selling a toy collection? Message me. Box Condition: Nothing is cut from the box. Box has some wear. Box has all the side and inner flaps. I'll let pictures describe rest. The box is in good condition. No foam or plastic. All toy pieces included! He has good joints. He shows light play wear. His stickers were never applied and are not included. He is complete with all of his accessories. Make Supersized Seem Small. We Buy Toy Collections! Selling a toy collection? Message me. Box Condition: Has all the inner and side flaps and nothing is cut from the bottom. I will let the pictures describe the box, as can be seen has some wear to the edges. Has two pinholes on the top flap There will be no surprises on the bottom. Figure Condition: Rated an 85 with light wear. This item was from a smoking home, but has no fading. My grading scale is 1 - 100 with mint flawless items a 100, near mint items a 95, excellent items a 90 and so on. This item is an authentic vintage Hasbro item. This item is not a fake, bootleg, reissue, remake or encore. Comes as shown. Sticker Condition: Rated an 85 Accessory Condition: 100% complete with all accessories, they are rated a 90. Joint Condition: Tight Paperwork: Includes paperwork as shown. Condition is Used but in great shape for its age. Selling a toy collection? Message me. Figure Condition: Rated a 70 with some wear. It is not broken. My grading scale is 1 - 100 with mint flawless a 100, near mint a 95, excellent a 90 and so on. This item is an authentic original vintage Hasbro item. This item is not a fake, bootleg, reissue, remake or encore. Comes as shown. Stickers: Some missing Accessories: None Joints: Some loose. This is in excellent condition. This is sold as-is, you will receive the exact item in the pictures. 1985 vintage Hasbro G1 Transformers PERCEPTOR 100% complete w/ original box !! Condition is Used. Box has Wear/Separation. Transformer is in Great condition and fully functional. Has all accessories. Shipped with USPS Priority Mail. Packaged carefully to prevent any damages from shipping. Check out Pictures for more detailed description of item Condition -US Seller - Fast Shipping -Note: If by some chance you experience an issue with your purchase, please contact us immediately so that we can provide a prompt solution before leaving negative feedback; We value your business. -Check Out Our Store. New Items Listed Weekly! Selling a toy collection? Message me. Box Condition: All the inner flaps and side flaps are intact. I will let the pictures describe the box. Box has light wear save right side area. Figure Condition: Rated an 80 with some wear, but needs light cleaning. My grading scale is 1 - 100 with mint flawless items a 100, near mint items a 95, excellent items a 90 and so on. This item is an authentic vintage Hasbro item. This item is not a fake, bootleg, reissue, remake or encore. Comes as shown. Sticker Condition: Rated a 90 Accessory Condition: 100% complete and they are rated a 90 Joint Condition: Tight Paperwork: Includes all paperwork shown. If you can find a better box then you got it made. Nothing is cut from the box. There is price sticker residue on front & back of box. Paperwork & all weaponry is included 100% complete. Sadly there is a missing side mirror. Selling a toy collection? Message me. Condition: This item comes as shown. I think all the manuals are complete but I might have missed one. These do have wear. Selling a toy collection? Message me. Figure Condition: Rated an 80 with some wear. It is not broken. My grading scale is 1 - 100 with mint flawless a 100, near mint a 95, excellent a 90 and so on. This item is an authentic original vintage Hasbro item. This item is not a fake, bootleg, reissue, remake or encore. Comes as shown. Stickers: Some missing Accessories: None. Joints: Tight. Selling a toy collection? Message me. Figure Condition: Rated a 70 with some wear. The deck does not work, which is a common problem, they can be repaired generally. My grading scale is 1 - 100 with mint flawless a 100, near mint a 95, excellent a 90 and so on. This item is an authentic original vintage Hasbro item. This item is not a fake, bootleg, reissue, remake or encore. Comes as shown. Sticker Condition: Rated an 80 Accessories: 100% Complete with all accessories and they are rated a 90 Joint Condition: Tight. Used Condition this lot has both instructions booklets for Overdrive and Downshift and comes with 1 weapon each. The weapons have wear and scuff marks as is condition. Selling a toy collection? Message me. Figure Condition: Missing one wheel, but needs cleaning. Rest is good and comes as shown. This is in excellent condition with nice decals. This is sold as-is, you will receive the exact item in the pictures. Its one of the best ones ive seen in its condition. Not complete. 1985 vintage Hasbro G1 TRANSFORMERS Mini Car HUFFER w/ backing card AUTOBOT toy!